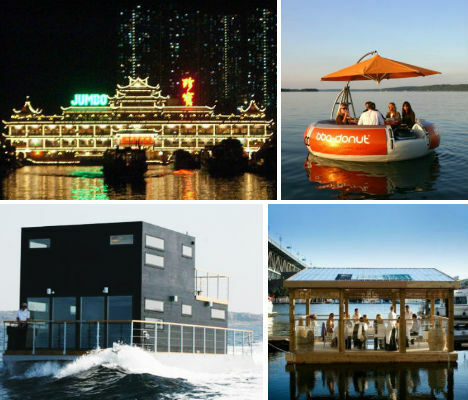 From massive illuminated Chinese restaurants to cute little BBQ tables for ten, these 14 floating restaurants make smart use of available space and turn the dining experience into something of an adventure on the sea. 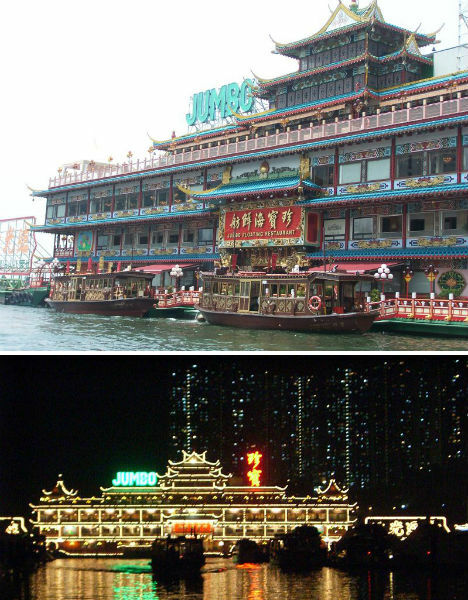 One of Hong Kong’s biggest attractions, the Jumbo Kingdom Floating Restaurant sites within the city’s Aberdeen Harbour and has hosted the likes of Queen Elizabeth II and John Wayne. Though it began as a relatively humble floating restaurant in the ’70s, a 2003 renovation basically turned it into a theme park with sightseeing, shopping and cultural attractions. Germany’s BBQ Donut restaurant is definitely one-of-a-kind. First of all, its floating tables, which have seating for ten, make smart use of water space and are quite a novelty draw. At the center of each of these tables is a BBQ that turns into a picnic table. Each floating pod has its own built-in sound system and even silent electric propulsion so it can cruise around. The Salt & Sill is a minimalist 23-room barge that also serves as a top-notch seafood restaurant specializing in herring and fresh local produce. All 23 rooms have their own outdoor seating areas, but the hotel’s sole suite has an extra-enticing benefit: a private roof-top jacuzzi. The hotel’s location on the lake, by the way, is not a gimmick: the adjacent land simply didn’t have any room. 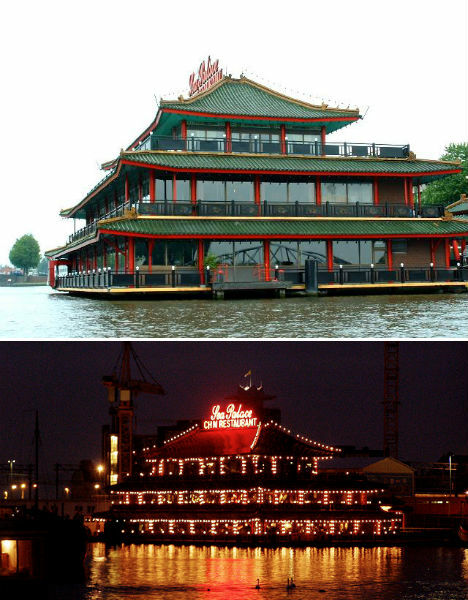 The ornate Sea Palace is Europe’s first floating Chinese restaurant, and is located near Central Station in Amsterdam. Its pagoda-style exterior is definitely not a sight you would expect to see in Amsterdam, but floating Chinese restaurants like Sea Palace are actually not uncommon in Europe. 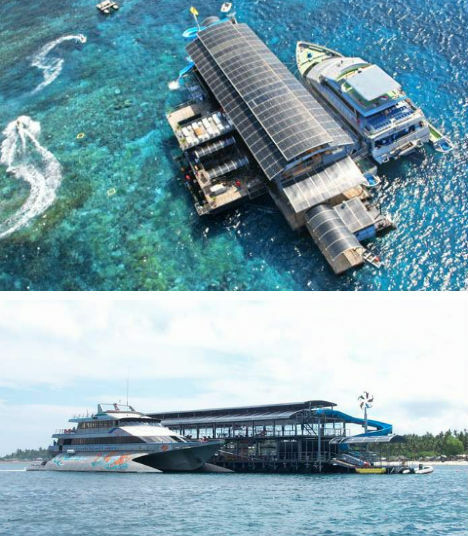 Just off the small island of Nusa Penida, which is itself located near Indonesia’s Bali Island, is this cool-looking floating restaurant. The massive pontoon restaurant can be found just off Toya Pakeh beach. 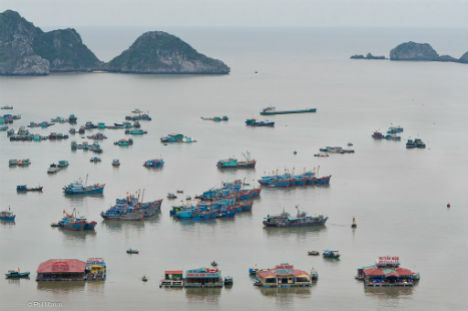 Vietnam’s Cat Ba Bay is home to several floating restaurants, which make for an interesting sight as they bob in the water alongside floating homes and fishing boats. Most of them are, of course, seafood restaurants. 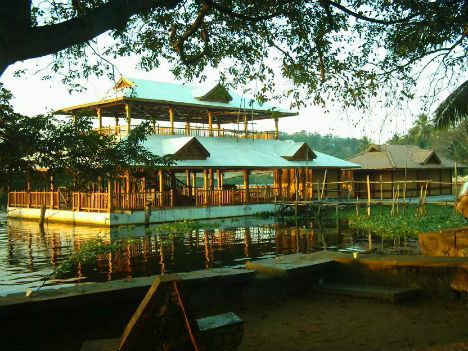 This pretty floating restaurant can be found in Veli Lake in Trivandrum, India. The restaurant is connected to the mainland by a floating bridge. 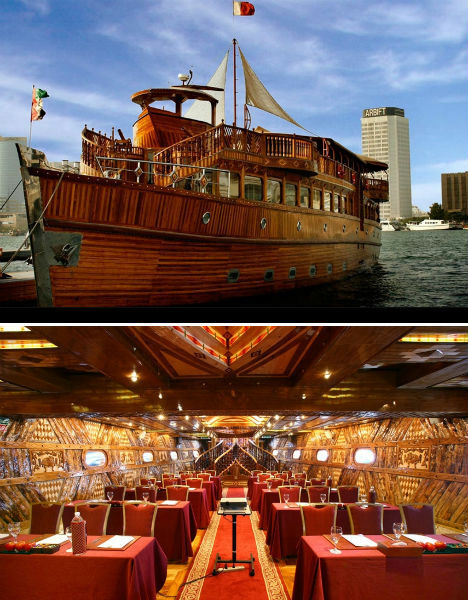 Rustar Dhow is the world’s largest floating restaurant that actually cruises around instead of just staying in one place. It’s located in – of course – Dubai, where everything is bigger and more ornate than it is everywhere else in the world. The Rustar Dhow can carry up to 400 passengers at a time. 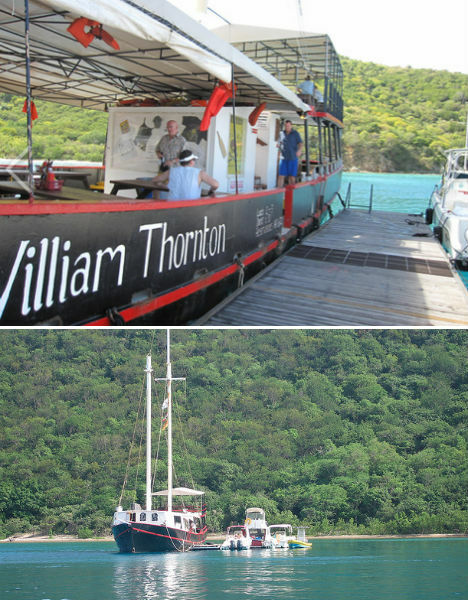 Anchored out in the water off Norman Island in the British Virgin Islands, ‘The Willy T’ is only accessible by boat. 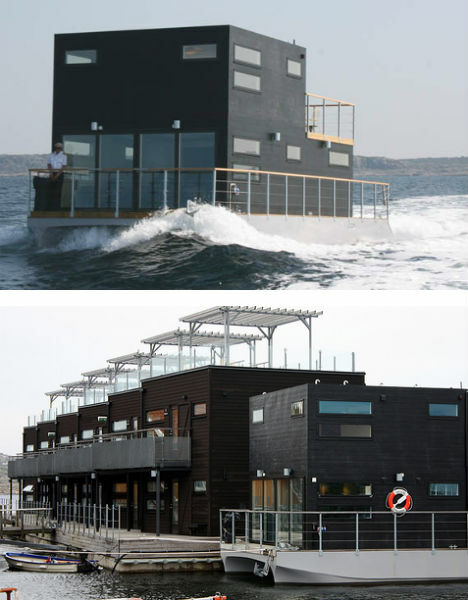 This floating bar and restaurant is known locally as one of the wildest ‘party barges’ in the area. It’s been in operation since 1985 and offers both lunch and dinner. 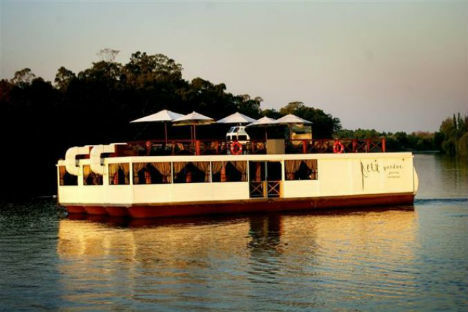 The Petit Vardo floating restaurant is located adjacent to the Riviera on Vaal Hotel, which is in the Vaal River about 45 minutes from Johannesburg in South Africa. 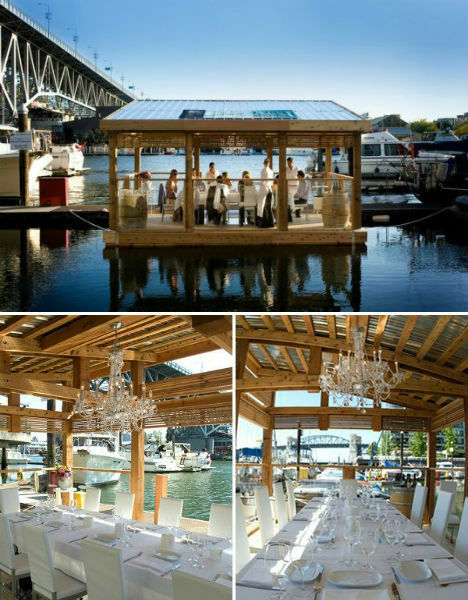 The barge is topped with an exposed dining deck, and the whole thing is illuminated at night like a giant floating lantern. 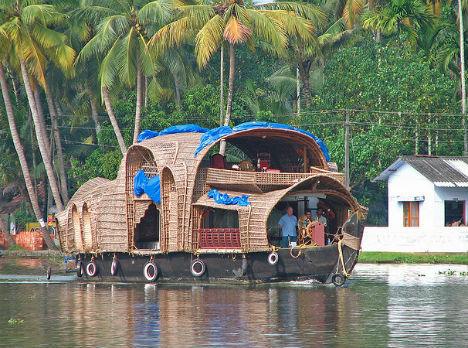 In the Indian state of Kerala, beautiful houseboats with thatched roofs are a common sight floating on the water. Many of these luxury houseboats are open to tourists, who can come onboard and relax while enjoying a freshly cooked meal from the boat’s kitchen. 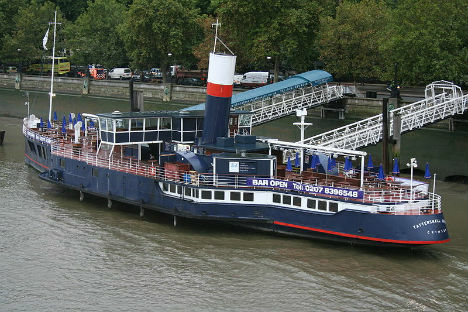 Moored in the River Thames in London, the PS Tatterhsall Castle is a former passenger and goods ferry built in 1934. During World War II, it was the first civil vessel to carry radar, but by 1973 the ship had run its course and was retired from service. Since 1981, it has been a popular bar and restaurant. This lovely little floating dining room made by the School of Fish Foundation is held aloft by 1,672 plastic bottles. Made of reclaimed pinewood, the dining room serves an elegant six-course sustainable seafood menu catered by C Restaurant. 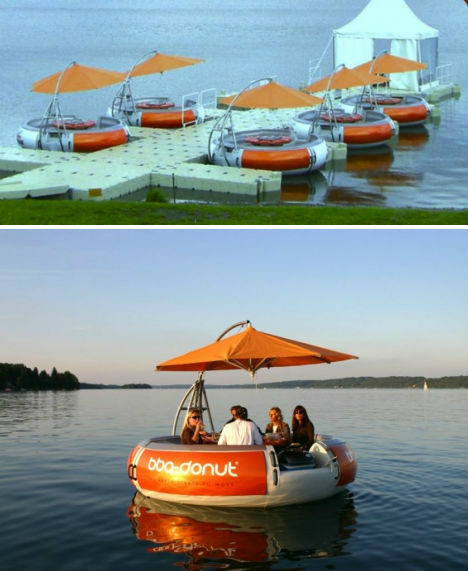 Have you been wondering this whole time whether the docked floating restaurants ever escape from their moorings? It has, in fact, happened. 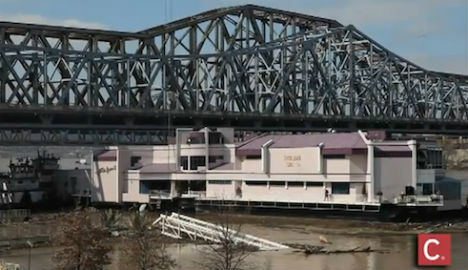 Waterfront, a floating restaurant near Cincinnati, broke free in March of 2011 with 83 diners on board. The diners had to be rescued using “a makeshift gangplank of ladders and ropes” while the restaurant was saved from floating too far downriver by tugboats. Unfortunately, the accident caused a lot of damage and the restaurant has not been re-opened.